Large upright shrub with glossy green lobed leaves. 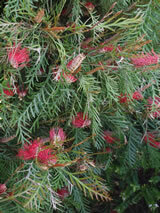 Most of the year it has large red flowers on the tips of the branches. Insects and birds love the nectar. Prune back after flowering for the best shape. Good for hedging. Prefers a sunny site with well drained soil, avoid very frosty sites.